If I’m being honest, Travis Ford wasn’t my first choice for SLU job after the team fired Jim Crews. I’d loved Ford’s teams with Marcus Smart and Phil Forte, but I figured that Bryce Drew, with his ties to the city and success at a mid-major, would be the perfect coach to revitalize our local recruiting and inject new life into the program. As is often the case, I was wrong. 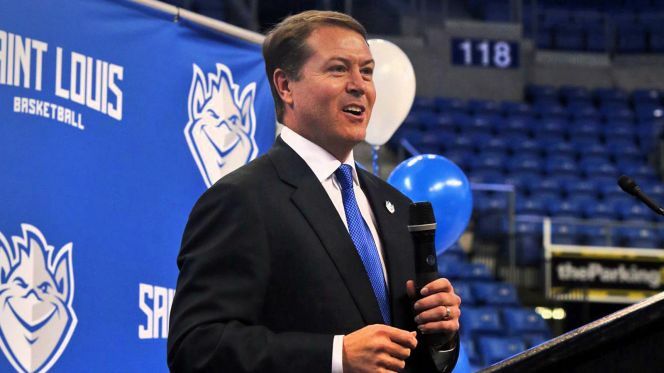 I cannot say this clearly enough: Travis Ford is the perfect coach for Saint Louis University. In just 3 years, he has taken the Billikens from being picked last in the A-10 to the NCAA Tournament. Considering where the program was, what Ford has done at SLU has been nothing short of remarkable. There have been stumbles, certainly, but he’s managed to keep the team together and put out a squad that plays with tremendous amounts of pride each and every game. St. Louis is a big city with a lot of the characteristics of a small town. It can be a tough place for an outsider to get the hang of, but Ford immediately dove in and you can tell he just gets this city. He gets its quirks, its neuroses, and, most of all, the pride that St. Louisans have in the city, and it paid off almost immediately. When Ford got Jordan Goodwin to commit to SLU, it was a sign of things to come. Goodwin not only was a top 60 recruit, he’s a recruit with a tremendous amount of pride in the St. Louis area, the Metro East, and all that he represents. Ford was able to sell him on playing for Saint Louis University and for St. Louis because he gets what it means for players to represent this town, and the potential that this school has. It’s not just Goodwin though. Ford has recruited Fred Thatch Jr from Sikeston, and incoming recruits Terrence Hargrove Jr., Yuri Collins, and Javonte Perkins are all St. Louis natives. It’s not a trend, it’s a movement. It takes a special type of team culture to have the type of run SLU had in Brooklyn, and it came from SLU having an exceptionally tight team. A lot of the credit goes to the players. As DJ Foreman told me, they basically hang around each other 24/7, and that familiarity shows on the court, in the way they are all able to bear down and work towards a common goal. I don’t think a player on the team could accurately explain what Team Blue means, but they all know exactly what it means and they live by it. Ford helps facilitate that atmosphere and is able to bring that closeness and familiarity out on the court. Ford has built a program that almost seems like a tight knit family, and that’s rare in college basketball today.